I loved and admired Postman Pat for two reasons. The first was the fact that he used to wake up so early in the morning (something that I could never do) and the second was for the striking resemblance he bore to my father in his Salvation Army uniform. I’m sure the latter won’t appreciate me making this opinion public and so I’d better backtrack quickly! 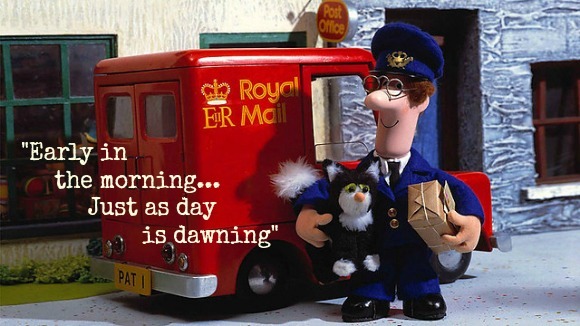 Now that I'm older, I can see why Postman Pat had such a jovial disposition every morning; there’s something incredibly satisfying about being awake at dawn. An idea that my student self would never have imagined possible. As the Sun’s first rays work their way around the globe, Muslims are slowly waking up to pray the first of their daily prayers - Fajr. This has always been my favourite prayer, probably because initially I thought it was pronounced “fudge,” an illusion which I was under for longer than I care to admit! There are several hadith which state Fajr is God’s most favoured prayer too because it is done while others are asleep. Muhammad (pbuh) is also reported to have said that if people knew the value of this particular prayer they would even crawl to the mosque to pray it! The Fajr prayer is shorter than the other daily prayers. It is composed of only two rakat, which in lay man terms means two sets of standing up, bowing and prostrating (sujud). Fajr is half the usually length of the other prayers which means that it's easier to do after waking up when you’re drowsy and barely functioning, although it is recommended to do an extra two rakat beforehand if possible. Sometimes this just means a bit of accidental head bashing on the carpet because your co-ordination is a little skew-whiff. If you’re half asleep, you might suddenly regain consciousness halfway through prayer and realize you've been doing “zombie salah!” In which case, you can re-do it properly once you've come to and splashed some cold water on your face. During Ramadan, Muslims eat a meal before fasting begins called Suhoor. I've always followed the proverb ‘eat breakfast like a king’ unlike Italians who tend to just have a little caffeinated froth (See: What Do Italians Eat For Breakfast?). I now have the added incentive that suhoor is highly encouraged. After a hearty meal and a water top up, it’s uncomfortable to go straight to sleep (See: Wobble Belly Woes). This is especially true if you sleep on your tummy because it’s like balancing on top of a water balloon! A full belly is a great incentive to stay awake and be productive rather than fritter and snooze away the hours in an offhand way. You can use the time between prayer and the sun rising to read Quran, especially if your aim is to read the whole Koran during this month, or you could make dua (non-obligatory prayer) for your friends and family. Practically, you could do bits and bobs about the house in this time because it'll be much easier than later in the day when you probably start to wilt. For myself, I’d like to follow the advice of Rebecca Minor who spoke about staying on the prayer carpet between the beginning of prayer and the arrival of dawn in a recent video collaboration with Nye Armstrong. For myself, I know that setting a stay-on-the-carpet rule would help me to concentrate because otherwise I’d be up checking my phone or simply faffing about aimlessly. Facing the window is a perfect position to see the dawn light sneaking through the shutters. There’s something miraculous about watching shards of light and colour appear through the window, all perfectly orchestrated by the soundtrack of the dawn chorus (and several loud cicadas). Once you've seen the sun come up, you get the urge to go out and enjoy it. The post-Fajr morning air is a great time have a stroll and appreciate the architecture and green spaces of your city while everyone else is still in bed. What do you do before and after dawn/Fajr? How do you like to spend your mornings in the Summer? Qur'an Weekly are currently running a short video series called 'Qur'anic Gems' with Nouman Ali Khan. There is a short opening in Arabic and then a short thought for the day based on each Juz (one thirtieth) of the Qur'an. It's funny that you mentioned Postman Pat. I myself didn't grow up with Pat but when I was aunty to 3 little children I used to watch it on tv with them when I minded them. I can still hear the tune and lyrics... and oh yes I remember The Windy Day. As to Fajr, it is the one of the most peaceful times in the whole day - that period from Fajr until sunrise. When everyone is sleeping and as the sun begins to rise you can hear the birds start to wake, subhanallah! Wa alaykum salaam, thank you for sharing that particular hadith. ha! that's funny that you remember The Windy Day too! inshAllah you're having a lovely Ramadan so far.